​Review by Travis Chi Wing Lau. Ever since my early encounters with queer writing, I have been fascinated with the concept of melancholy1. I came to graduate school wanting to better understand this strange affective constellation and its relationship to the histories of marginalized bodies. Unsurprisingly, I first came at the question of what constituted melancholy from the vantage point of sexuality—a product of my intellectual formation during my undergraduate studies and my own personal reckonings with who I was after a decade living in the South. It took my own diagnosis with anxiety and depression during my first year of graduate school to reveal the limits of my own understanding of mental health barely talked about at the family dinner table. Alone in the affective density that was my depression, I found myself disarmed: entirely without a vocabulary with which I could describe and begin to know the nuances of my own grief, my own loss, my own unmooring. As each poem documents how her and her family’s “bodies domesticate / disaster: by swallowing // another country’s rains,” Past Lives, Future Bodies experiments with different poetic forms that can both express the thickness of racial melancholy and intervene in the traumatic experiences of racism and assimilation (1). Chang shifts from couplets to two-column narratives to sestets with an unpredictability that embodies her desire of “wanting a country to home” and a “body to hone” (4). It is this desire that forces us to read beyond the end of the line, that begs the question about what absent presences linger within spaces between stanzas. By refusing formal stability in poems like “Closet Space,” Chang demonstrates how racial melancholy is itself enjambment. Language ultimately becomes the means by which Chang can inhabit not only the queerness of her own desire but the otherwise inaccessible desires of generations before her that bear unexpected, uncanny similarities. In these pleats of time sewn together, kinship is beyond blood; it is shared affect, shared desire alive in verse. Eight years ago, I wish I had had Chang’s book as a model for articulating what I felt then was the inexpressible. I can’t say I agree with readings of Past Lives, Future Bodies as poetic butchery that cuts its way toward the “future bodies” it imagines. The project, to me, seems far more reparative—an extended suturing that is unafraid of the blood already drawn, “of the dead [that] are still dying” (11). The sharpness that readers identify is in the verses’ insight, the incisiveness of the needle that threads together histories, bodies, and lived experiences separated by the need to survive in a nation that does not want us. Chang’s queer method of “unstitching this country / along its rivers, this body / shrugging free of its seams” is a poetic indictment of a delusional national narrative obsessed with inherent greatness. The feelings of suspension, of failure that keep alive this narrative are lived out in bodies of color. Melancholy is still mourning. There must be an unraveling before future bodies can be sewn. 1For more on my formative experiences with queer literature, see https://medicalhealthhumanities.com/2018/01/15/revisiting-aids/. 2“A Dialogue on Racial Melancholia.” Loss: The Politics of Mourning. eds. David L. Eng and David Kazanjian. Berkeley: University of California Press, 2003. 343-371. 4The Melancholy of Race: Psychoanalysis, Assimilation, and Hidden Grief. Oxford: Oxford UP, 2001. 17. 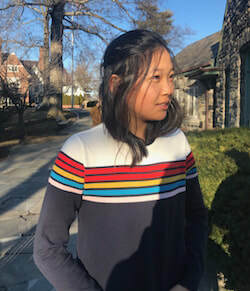 Kristin Chang’s work has been published in Teen Vogue, The Rumpus, The Margins (Asian American Writers Workshop), the Shade Journal, and elsewhere. Her work has been nominated for Best New Poets and Best of the Net, and she has been anthologized in Bettering American Poetry Vol. 3 and Ink Knows No Borders(Seven Stories Press). She is a 2018 Gregory Djanikian Scholar (selected by The Adroit Journal), the recipient of a 2019 Pushcart Prize, and a Resist/Recycle/Regenerate fellow with the Wing On Wo Project in Manhattan Chinatown. Past Lives, Future Bodies is her first chapbook.